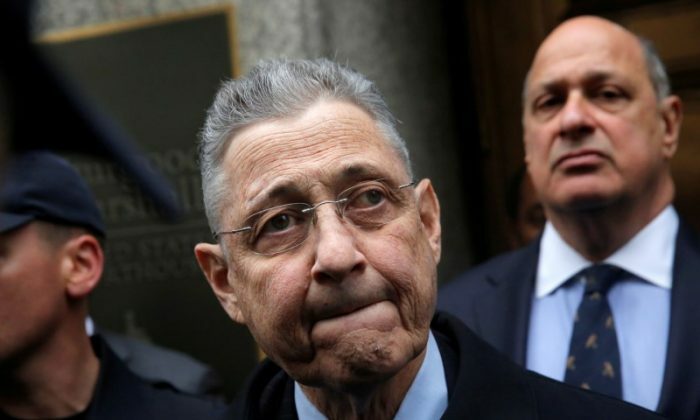 NEW YORK—Former New York Assembly Speaker Sheldon Silver was found guilty of corruption charges on Friday, May 11, by a jury in Manhattan federal court after an appeals court threw out an earlier conviction. “As a unanimous jury found, he sold his public office for private greed,” Berman said. A lawyer for Silver could not immediately be reached for comment. Once again a jury has found former Speaker Sheldon Silver guilty on all counts. The justice system has done its job ensuring one of New York's most corrupt politicians since Boss Tweed pays the price for abusing his power and personally benefitting from his elected office. In retrial former assembly speaker Sheldon Silver swiftly found guilty on all counts. Great work by the SDNY team once again. All New Yorkers should be grateful. The Supreme Court found in that decision that routine political activities such as arranging meetings or reaching out to public officials were not “official acts” that could be prosecuted under federal bribery law. Silver, a Democrat, represented Manhattan’s Lower East Side, and was Assembly speaker from 1994 to 2015. Along with Governor Andrew Cuomo and former Senate Majority Leader Dean Skelos, he was one of the few people with effective power to dictate New York legislative priorities. Skelos was convicted of corruption charges in December 2015 and sentenced to five years in prison. His conviction was overturned last year as well, for similar reasons as Silver’s, and prosecutors have said they would try him again.